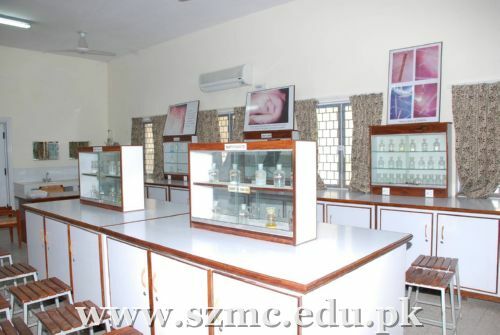 The department of Forensic Medicine & Toxicology, SZMC was established in March 2005 and it was housed temporarily in a room in the Biochemistry department of the college. With the acquisition of the current building, it was renovated and modified according to the needs and the latest trends of this important speciality in consonance with the vision of the Principal, SZMC, who has been extremely generous in providing the funds and other pertinent logistics. His efforts came to fruition in the form of the establishment of one of the best Autopsy Lab in the country. Same H. O. D is continuing from date of establishment of the department from 12-03-2005..
(For post graduate training FCPS & MCPS): April 24, 2010. An air-conditioned lecture hall with the capacity of 250 students, furnished with modern audiovisual arrangements is attached with the department. Overhead Projector, Multimedia, Slide Projector and Epidiascope are available all the time within the lecture theatre for teaching of undergraduate as well as post graduate students with modern coaching techniques. . 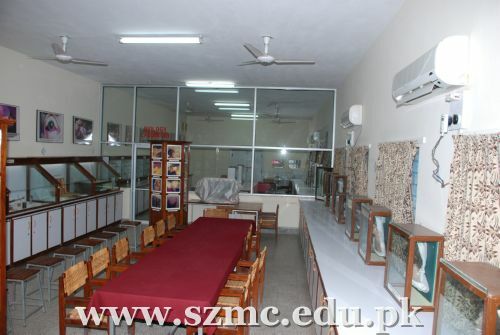 The air-conditioned museum of the department is the most impressive one, spreading on 1100sq feet having wax models, bone specimens, instruments, weapons, a very large collection of X-rays, dura-trans, panaflex, photographs and other exhibits thus imparting knowledge and contributing to other teaching and training facilities directed to the postgraduate and undergraduate students. There are six hundred projection slides available all the time in the museum for review purpose. 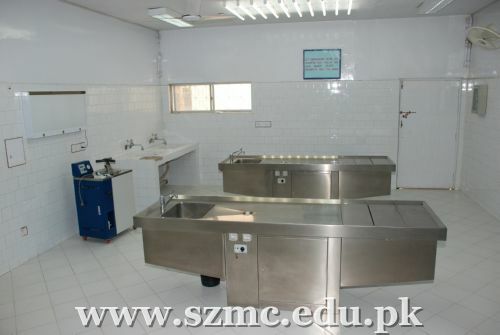 A modern & well equipped newly constructed autopsy lab is present with the department for academic purpose as well as for public and state services. The lab is provided with 2 stainless steel autopsy tables (made in Germany). Ice blue florescent electric tubes are provided in the lab for sufficient light at table level. The floor and walls of the Autopsy lab are covered with impervious white tiles. In addition to this the lab is furnished with proper “reverse ventilation” and closed “water gulley system” for drainage.A change room and lavatory is also provided. The sterilization of the Autopsy lab is done by ultraviolet light. Students coaching area is built in the Autopsy lab for proper undergraduate as well as postgraduate training. There is an Italian dead body freezer with the capacity of preservation of 2 dead bodies present in the room attached with the autopsy lab. Mortuary facilities for dead bodies is also present within the vicinity of the lab that holds the capacity of storing 20 dead bodies. A medicolegal clinic is situated in the emergency department of Sh. Zayed Hospital / Medical College, Rahim Yar Khan for catering the medicolegal cases from Rahim Yar Khan City. A well equipped class room of 50 student’s capacity is attached with this clinic for practical coaching of the undergraduate and post graduate students. Seven trainees for M.C.P.S (Forensic Medicine) have completed their training till 2015. Dr. Qurat ul Ain Kamran. Dr. Hafiz Muhammad Ali Akhlaq. Three trainees for M.C.P.S (Forensic Medicine) training are currently inducted since the year 2016. Training will be started for FCPS Part – II in the subject of Forensic Medicine, as accreditation of the department has been achieved. Trainees will attend the training programme for a period of 3 years. During this period they will take part in the routine work as well as other activities of the department like seminars, workshops, group discussions and conferences. Trainees will also rotate in different disciplines of the institution. Trainees will also be rotated in various centers of excellence in the following ancillary specialties. Following training programme will be conducted during stay of the training in the Forensic Medicine department.